The polar vortex, a swirling mass of arctic air, dipped deep into the central U.S. at end of January, bringing record cold to the area. It was a short-lived excursion, however, retreating back into Canada by early February. In its path, nearly 1,400 temperature records were broken, mostly in the Midwest. Temperatures dropped to as low as -20°F in areas of northern Missouri and -11°F in the central part of the state on January 29. 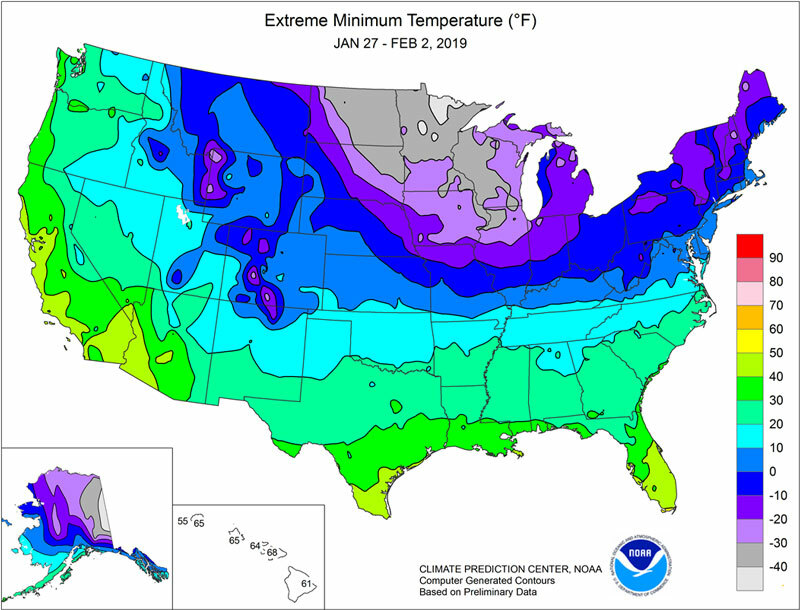 Extremely cold temperatures that occurred in early 2019. These frigid temperatures likely injured the buds of some woody plants that are only marginally winter-hardy at our latitude. Some of the less hardy woody plants that tend to suffer from low temperatures in Missouri include crapemyrtle, Southern magnolia, mimosa, rhododendron, holly, red buckeye, Japanese maple, and boxwood. For fruit trees, it is difficult to predict the severity of low temperature injury in mid-winter. Apple floral buds generally tolerate temperatures as low as -25°F. Plum and cherry floral buds are less cold-tolerant with injury likely at -20°F. For peach floral buds, some injury may occur at -10°F with severe bud loss at -20°F. Fortunately, many landscape plants were fully dormant (in endodormancy) with a low water content in their buds, which makes these tissues cold-tolerant. Also, woody plants were generally well acclimated when the polar vortex whorled into Missouri since temperatures during the two weeks preceding the bitter cold were relatively low. There are many factors that influence low temperature survival of woody plants. Tree species or cultivars vary in their ability to withstand cold temperatures. The newest growth, especially on young plants, is more susceptible to low temperature injury than more mature branches on older plants. Generally plant buds attain their maximum cold hardiness in mid-winter, but can rapidly deacclimate when temperatures rise above 58°F. For fruit trees, once the trees have accumulated sufficient hours of chilling temperatures usually in late January in Missouri, fruit buds deacclimate rapidly when warm temperature episodes occur, but are then slow to reacclimate when temperatures fall. Trees and shrubs that entered the winter in a healthy state are more likely to survive winter injury than those previously injured by insects or diseases. As always, prune fruit trees, in late winter, removing any dead branches. Also, remove overlapping branches that compete for sunlight and maintain the natural form of ornamental trees and shrubs. In early spring, fertilize woody plants, provide adequate moisture before stress occurs, and minimize pest damage, especially for those that suffered limb dieback or bud injury. Healthy plants tend to survive the year-round stresses of Missouri weather better than weakened ones.